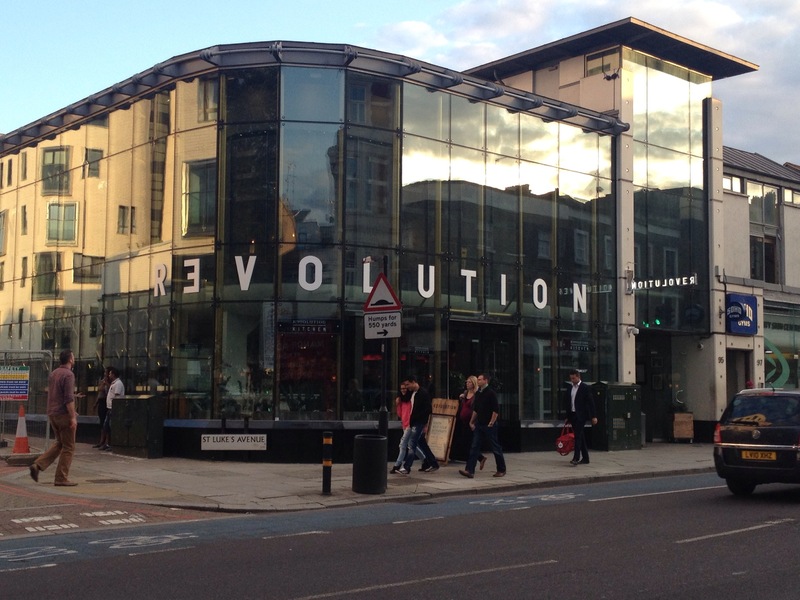 Revolution – Now for many, this may bring memories of late nights, cocktails and a wiggle here and there. But how many think of food? Well maybe you’re missing out! With lots of the “exciting trends” going on at the moment in the world of food, Revolution have launched a new menu, to “make the trend”, inspired partly by “taste inspiration” from the US, and I couldn’t wait to try it! Alex and I recently journeyed to Clapham High Street (I say journeyed, it’s really not that far from mine) for a meal at Revolution. I have been to Revolution a couple of times but I must admit that these were those late nights with the girls like I was talking about. I therefore already knew their cocktails were awesome but when I heard they had a new menu and it wasn’t your normal gastro pub grub, I was really intrigued and we just had to go! From the outside revolution looks pretty posh. Amazing glass front – definitely not the standard pub or bar look exterior. We turned up for our reservation at 7.30, and it was pretty quiet for what should be the dinner rush, but it was a Wednesday. Maybe you were all hiding away glued to your screens for GBBO! We walked in and headed towards the bar. The inside of revolution is pretty swanky, it doesn’t feel like your standard comfy pub, so you do feel like you’re going somewhere really nice for a meal – with a more reasonable price than somewhere like Sushi Samba! We were greeted by the manager on duty who showed us to our table and presented us with menus. Shortly after our waiter, Sam, popped over to introduce himself and take a drinks order. Sam kindly offered us water first as we were both being pretty indecisive with cocktails as there’s just so many to choose from, and gave us a couple more minutes. We finally decided and I ordered a sweet shop, and Alex ordered the midsummer mule. Sweet shop – Stoli Razberi vodka with banana liqueur, bubblegum syrup, shaken with cranberry juice, topped with lemonade and garnished with a strawberry pencil. Midsummer mule – Revolution’s strawberry infused vodka with lime juice and ginger beer. Our Verdict: Very tasty! Fab for a ginger beer fan. 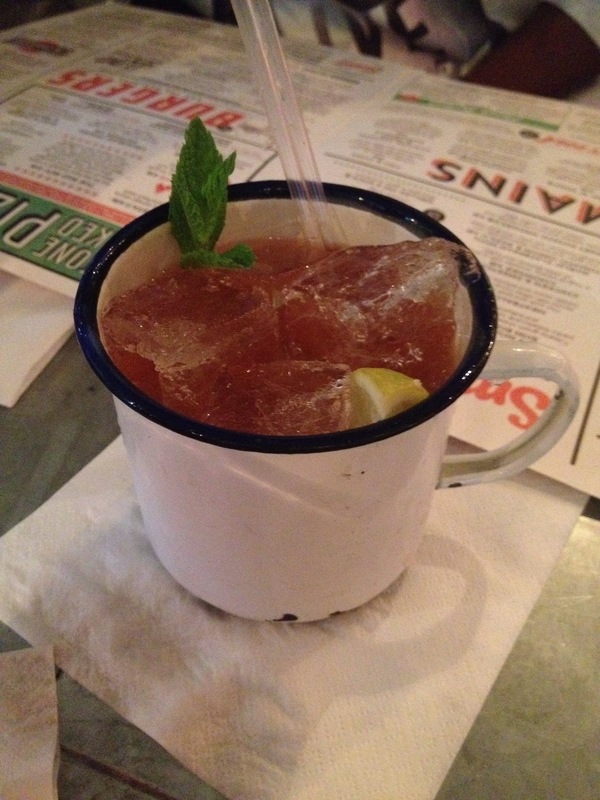 The Midsummer Mule has a strong gingery taste (shocker!) but with a fruity zest running through. It’s quite refreshing and even I really liked it – not the biggest ginger fan! Once Sam had returned with our cocktails we ordered our starters – One Crispy Goats Cheese Bon Bons and one of the Butterflied Shrimp, but still weren’t ready with mains – you can’t blame us! Take a look at the menu and you’ll see why it took so long. How can you choose one meal from these? I wanted them all! 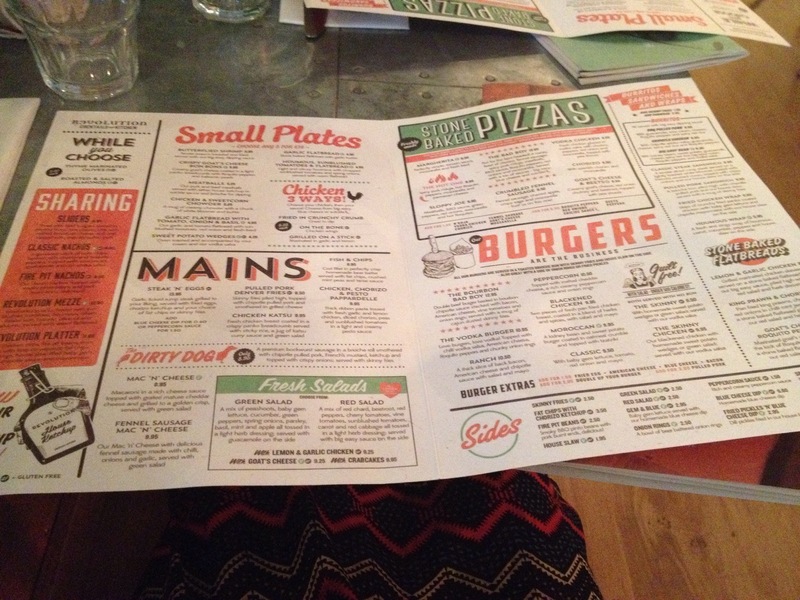 Click the image to see the full menu – How helpful am I? Sam was patient and really friendly, offering his recommendations of the chicken katsu or the chicken, chorizo and pesto pappardelle for mains. We managed to order our mains too just before our starters came. The service was at a good pace, I like it quick but not too fast that you feel like you’re flying through your night out. I went for the recommended Chicken, Chorizo and Pesto Pappardelle, although was very tempted by the pizzas as Revolution have “learnt a new way of rolling and handstretching the dough to create a really delicious and unique base.” But the Pasta temptation was too much! Alex went for the Bourbon Bad Boy Burger, and I will admit I was anticipating a little food envy! Crispy Goats Cheese Bon Bons. Our Verdict: These little balls tasted amazing. The chilli complimented the cheese surprisingly well. It was an even light coating of breadcrumbs, not greasy, and the portion was a great size before a main – not too heavy! Fab presentation and I love the crockery! Butterflied Shrimp. Our Verdict: Nice and crispy, didn’t taste greasy at all which is always great with fried food. The breadcrumb coating isn’t too thick (you know what I mean, I’m sure you must have experienced a place who serves breadcrumbs with a tiny bit of fish in the middle), and the shrimp were a good size. Tasted delicious! Again I have to comment on the crockery – Love it! 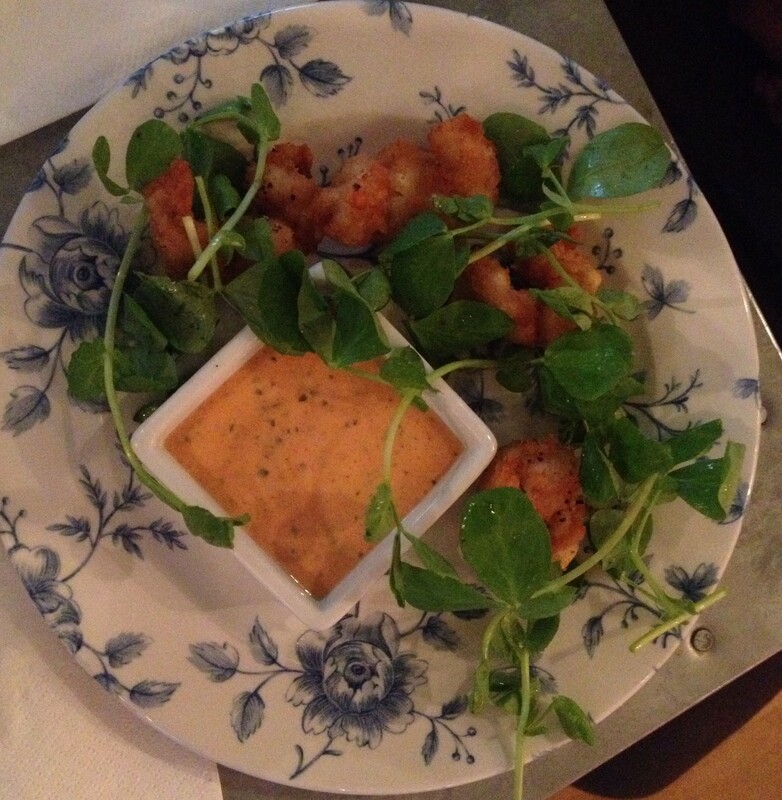 – and I really like the presentation with the watercress addition! 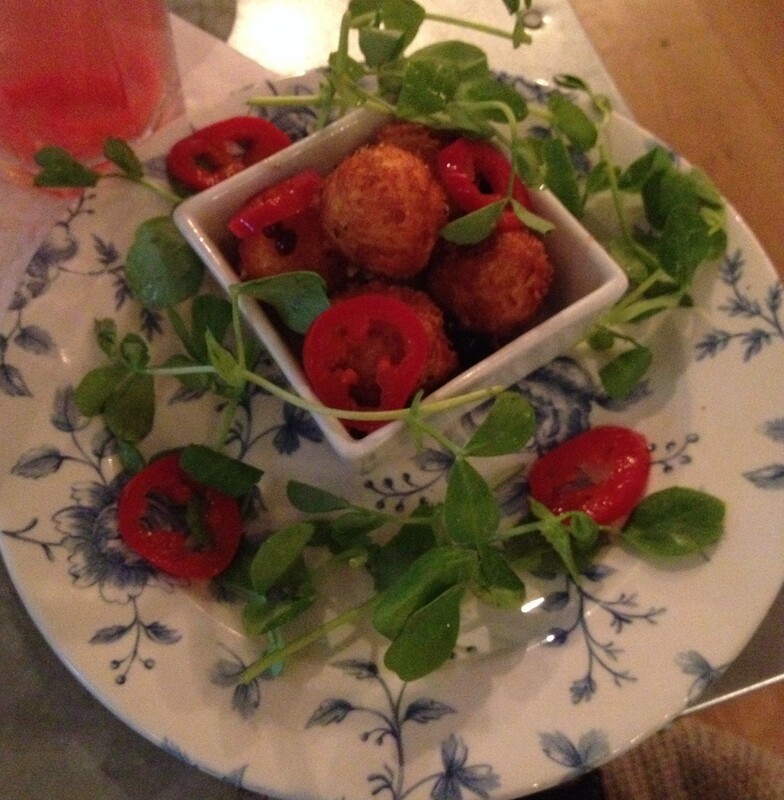 But we have to say the Goats Cheese Bon Bon topped the starters for us. Then it was time to loosen our belts (well, I was pleased I was wearing a floaty dress), it was time for the mains and I could see Alex’s gigantic burger making it’s way to our table! 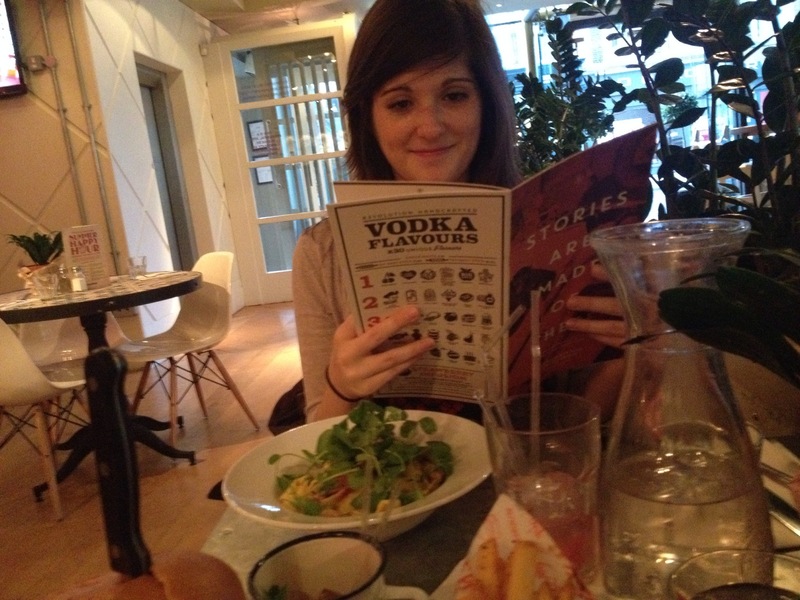 We had another quick peek at the cocktail menu and ordered another drink to come whilst eating our mains. 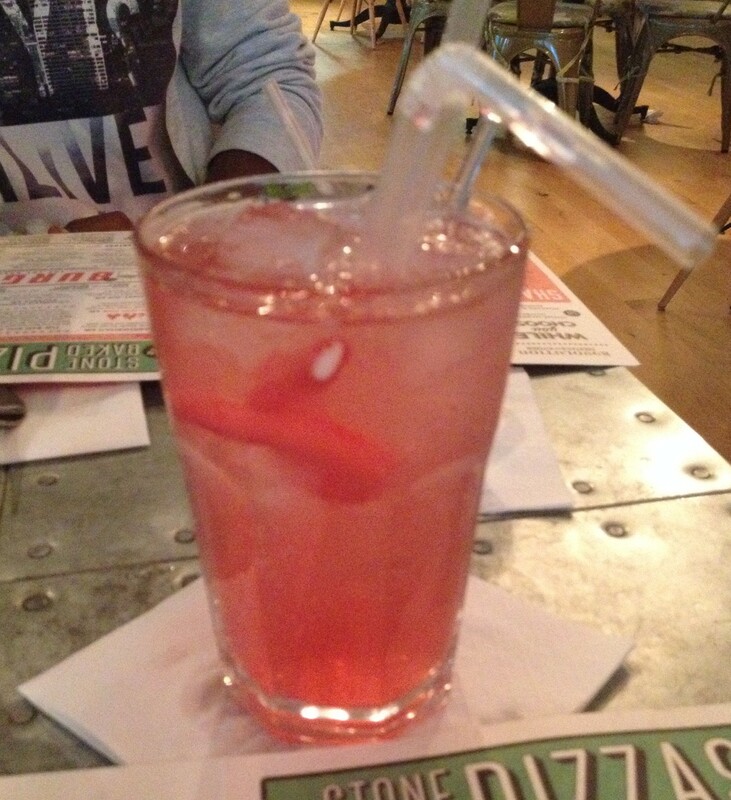 Our meals looked delicious and smelt amazing, so this time I had to make a snappier decision on my drink! My Main, The Chicken, Chorizo and Pesto Pappardelle: Thick ribbon pasta tossed with fresh rosemary, sliced chorizo and sun blushed tomatoes in a light and creamy sauce of pesto and sugar snap peas. Alex’s main, The Bourbon Bad Boy. 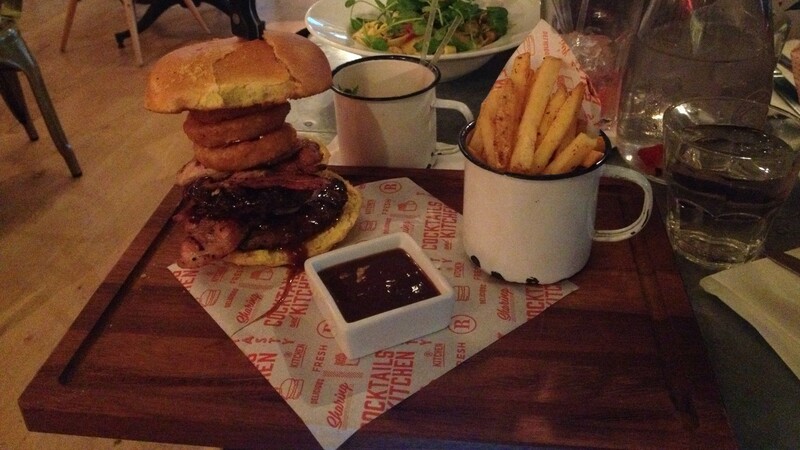 Double beef burger basted in bourbon chipotle sauce stacked with bacon, American cheese, vine tomatoes and onion rings. Served with a mug of Cajun dusted skin-on fries. Alex’s Verdict: At first glance it looked gigantic, and once you started eating it you realised it was pretty big! The burger was nice and juicy, the onion rings crispy and there was a good portion of bacon – some of the proper stuff, not the streaky slithers you get at some burger joints! The skin on fries were slightly seasoned which made them tasty, but the best bit had to be the Chipotle Sauce! Our cocktails were delivered to our table a little way through our meals, and although they were getting busier with evening drinkers, they still got our drinks to us in good timing! 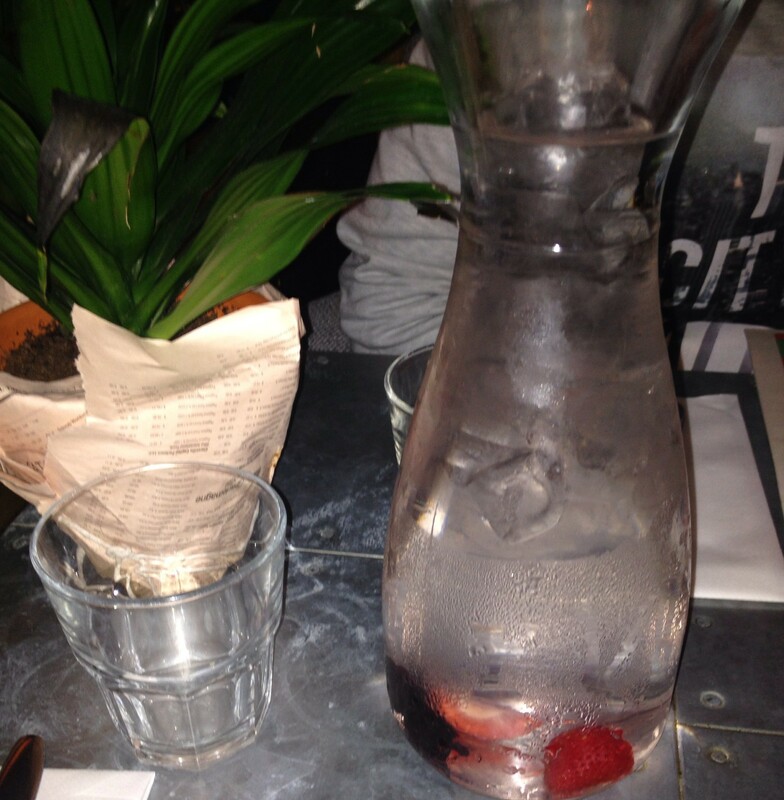 – If we got really thirsty there was always the water which was delivered to us earlier in the meal. Alex’s Second Cocktail, The Tennessee Mudshake: Stoli Vanil vodka and Jack Daniel’s Honey shaken with chocolate liqueur, milk & cream, topped off with chocolate sauce, whipped cream and broken Oreos. 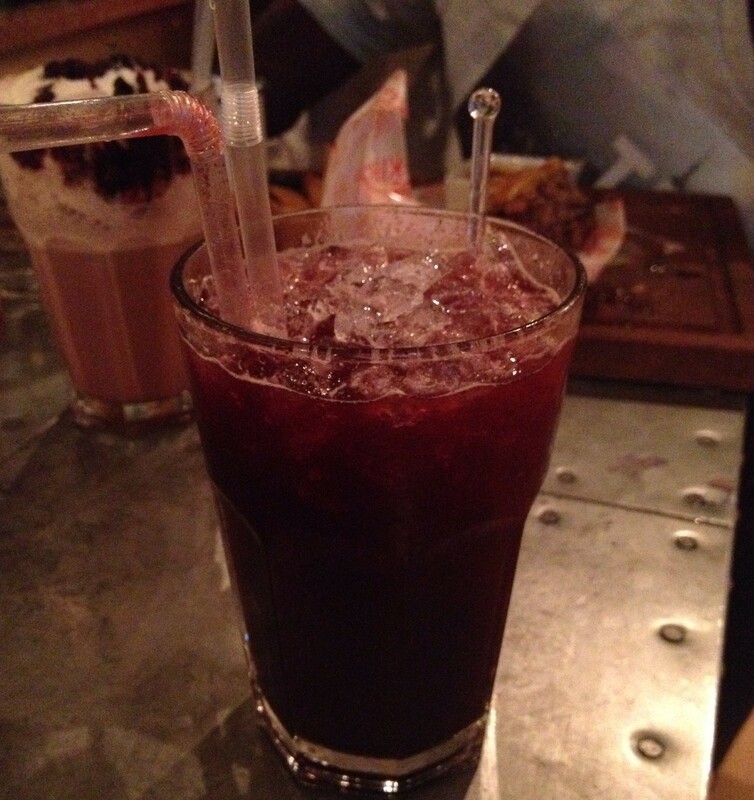 My second cocktail, The Jammy B*Stard: Absolut Original & Absolut Berri Açaí vodkas with Amaretto & Chambord, mixed with blackberries & apple juice. 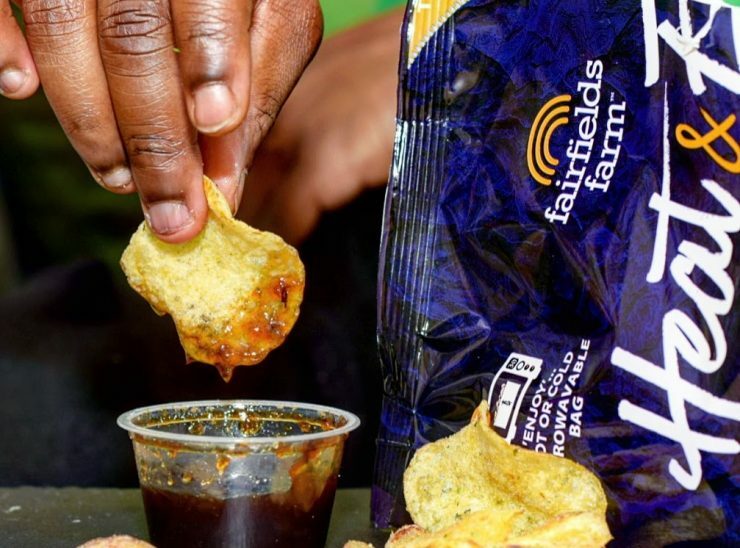 Our Verdict: You can tell why it’s been given the name. Very berry, extremely Jammy, perfect for a sweet tooth. I am a sucker for the more juicy cocktails and this really hit the spot. Smooth, tasty and refreshing! Once we had finished, even with the little breaks we had to give our stomachs, Sam cleared our plates and brought over the desert menu. I didn’t know how I was going to manage another course, but when the menu came out it didn’t take much persuasion! We decided to give it a little break, and I popped up to use the toilets. I always feel like I should comment on the toilets as these can be quite a let down with restaurants (especially those which are bars late into the night, well that’s what I’ve found from experience!). But these are really well kept, obviously checked often, and not bad to use at all! There is a full length mirror for those who double check themselves before they leave the toilets too…we all do it! I re-joined Alex at the table and we sat chatting for a short while. The music was on in the background, and perhaps a little louder than a top restaurant, but we could still have a conversation so it didn’t cause any problems for us. If you’re looking for a quieter table I’m sure they’d cater for you, and the day time I reckon would be quieter too, music wise. 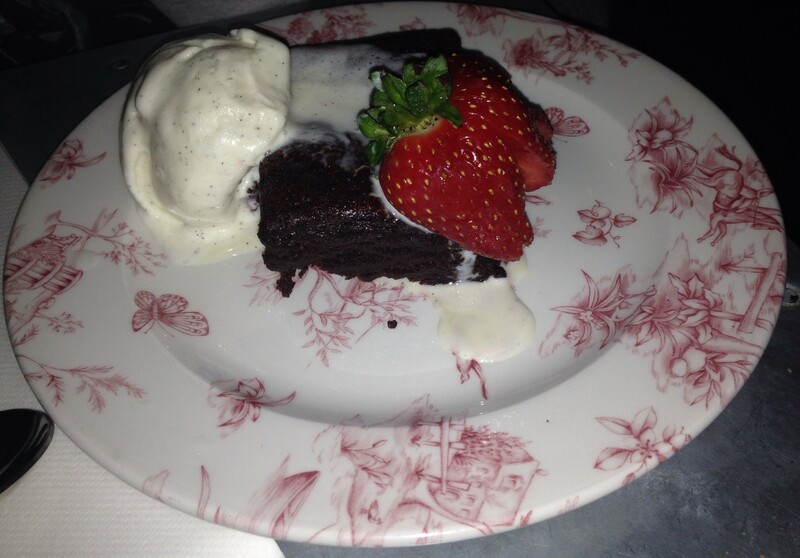 The Warm Chocolate Brownie: Chocolatey, gooey and deliciously indulgent, served with fresh cream. But Alex did get the option to have ice-cream instead! Alex’s Verdict: Very sweet, rich and chocolatey. It was presented really nicely, and he loved the addition of the strawberry, which he only wished he could have had a little more (but look at the size of that strawberry!). 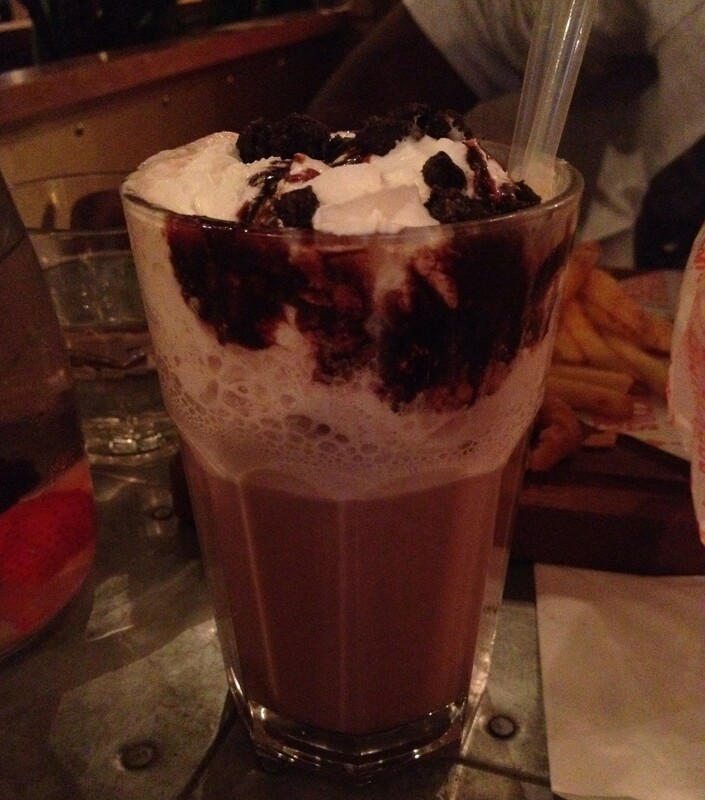 He said having it with ice-cream was a good choice, and highly recommends it to other chocolate lovers! 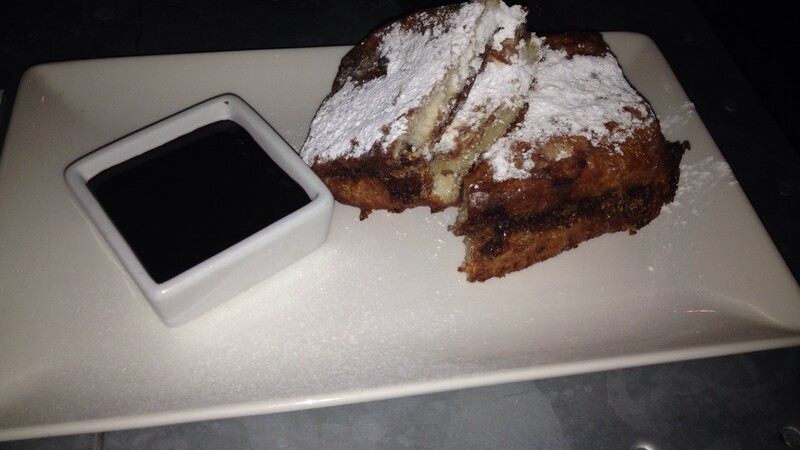 Chocolate and Blueberry Fluffwich: Fluffy dough, sandwiched together with chocolate and fluff marshmallow in a sweet batter, served with blueberry sauce for dipping! My Verdict: This is now on my list of top desserts EVER! This was insanely good, the dough tasted sweet, and the chocolate and marshmallow went perfectly with the blueberry sauce. As it was served warm too, the marshmallow was gooey and chocolate slightly melted. Mmmm this is making my mouth-watering just remembering it! We slowly made our way through our desserts, although I couldn’t finish mine I really tried. My body just isn’t used to three courses but it tasted so good I didn’t want to stop! We had our table cleared and two flavoured vodka shots were ordered – you should see their enormous list, it’s amazing how many flavours they have. We went for two relatively unusual flavours – The salted caramel popcorn and a pancake syrup. 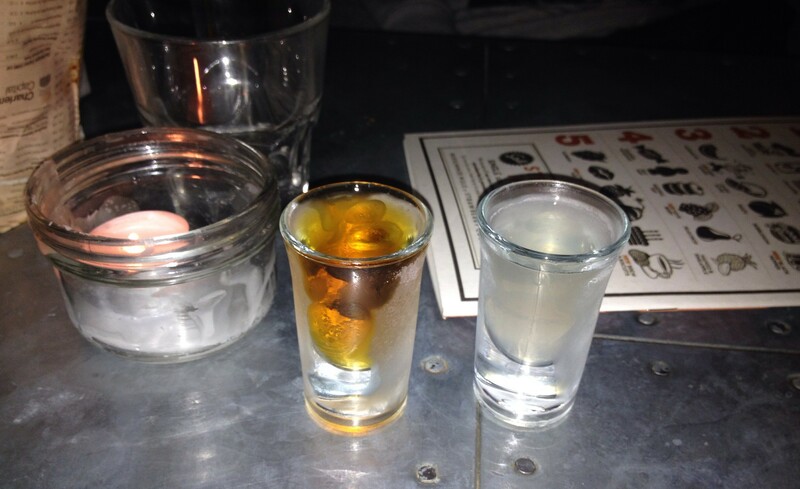 Now when many places say they do flavoured vodka, i’m usually a bit wary remembering my ays trying to drink corkys (eurghhh), so when these were delivered to our table I may have been a tad doubting of Revolution (Sorry Guys!). I looked at Alex and we both took our shot, me the pancake syrup, before counting to three. Our Verdict: AMAZING! It was incredible how much they tasted of their flavour, mine actually tasted as though I could have been drinking out of a maple syrup bottle! Alex said he could tasted the salted caramel and the popcorn. We really weren’t expecting it and would highly recommend trying one of these to end your meal! We sat for a short while and were checked by Sam once again. When we left we made sure to thank everyone for such a lovely evening! 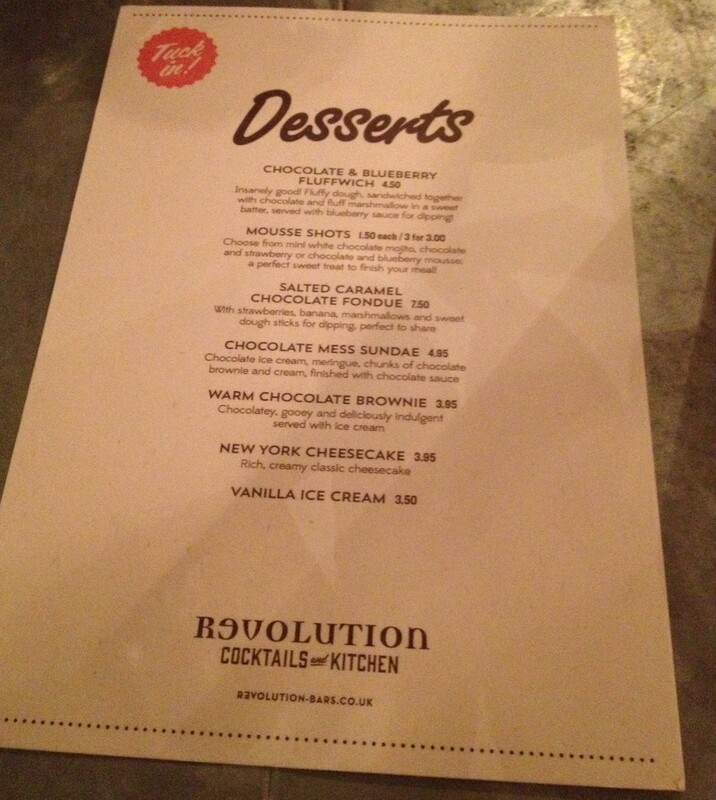 Revolution has a fab new menu with some great options and gives fantastic service. We had a lovely evening, and left extremely satisfied. 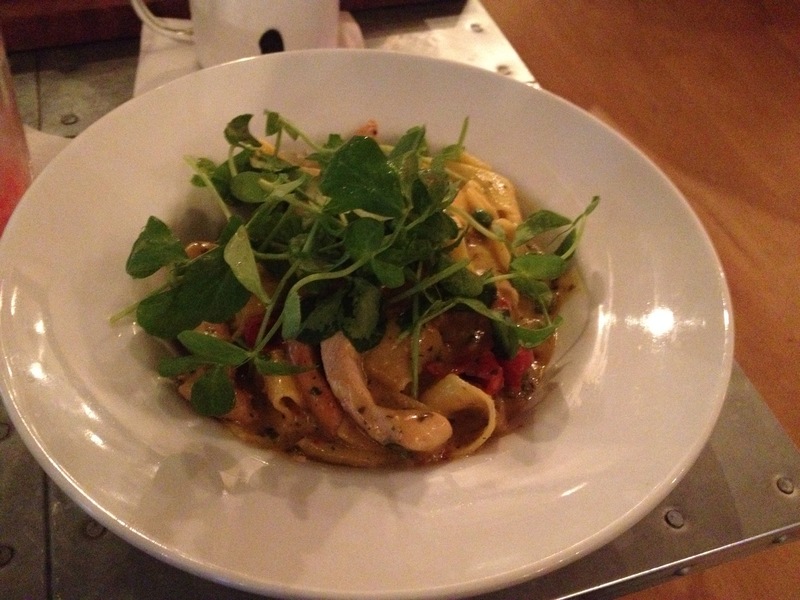 The service was in a timely manner, yet not rushed and the food tasted delicious. I highly recommend the pappardelle, but make sure you leave space for the Chocolate and Blueberry Fluffwich! If you haven’t been yet, I really do think it’s a must do. Great evening out, fantatic food and service for a reasonable price – whether it’s for date night with the other half, a group meal with friends or a family get together, how can you beat that? I was extremely lucky and even got to interview someone behind the new menu at Revolution!! 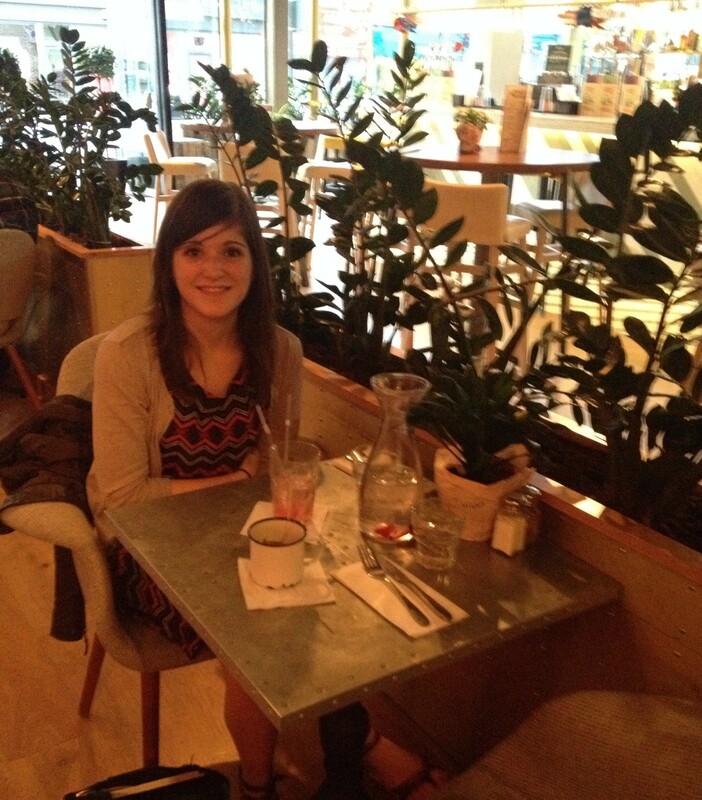 If you would like to read my interview with the food development manager, click here! Some fab and exciting things going on behind the scenes..
With Revolution “currently developing some really special dishes to add to the menu”, I’m going to have to keep my eye out! Definitely want to be trying those!